We have added a number of new sections on Dalmatian behaviour including, sleep and rest, separation anxiety and crate training. These have all been written by one of the behaviourists we regularly recommend Je–An Shields of Hampshire. We maintain a list of trainers and behaviourists whom we have used with success in various parts of the country. “I have worked with dogs for over 20 years. My passion for dogs started when I worked for the RSPCA as a kennel assistant back in the 1990’s. I also worked in a shelter in Mallorca for a while, where the conditions were incredibly basic. I was fortunate enough to obtain my first dog at the age of 30, and after a few years in the care industry, returned to working with dogs 14 years ago, as a dog walker. After a 3 year internship with the behaviourist (and acquiring my own group of teaching dogs), I then set up my own business in Bristol. Alongside this, I assisted in puppy classes, working on socialisation and clicker training. Over the years, my team of dogs and I, have worked with 100’s of dogs that needed to learn the finer points of canine etiquette. As well as specialising in dog to dog, and dog to human aggression, I also do basic training, behavioural consultations, and offer a professional dog walking service. I have provided foster care for rescue centres, rehabilitating dogs, so they are ready to go into their forever homes. I am a volunteer dog socialiser for the RSPCA Stubbington Ark in Fareham, Hampshire. 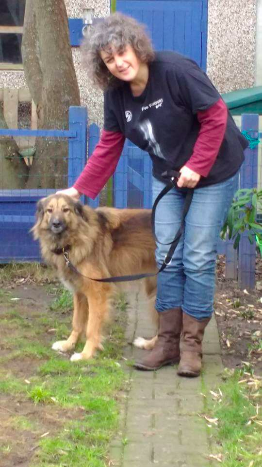 I am a certified trainer, and a member of the Pet Dog Trainers of Europe (www.pdte.eu), and am about to embark on an 18-month educational course with the wonderful and inspiring Turid Rugaas, who has been working with, and doing research about, dogs for the last 50 years. I have helped British Dalmatian Welfare by supporting and advising owners of recently adopted dogs.